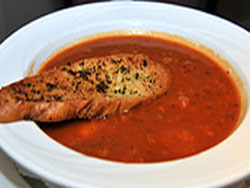 New England clam chowder is a milk or cream based, Manhattan clam chowder has red tomato color and flavor. Both are delicious and just depends what your in the mood for. Hope you enjoy these two recipes and if you have a variation you would like to share please click on the link below. Drain clams through a colander into a bowl, reserving liquid. Combine clam liquid and clam juice and set aside. Cook bacon in large pot until almost crisp. Remove most of the fat drippings, leaving about 2 Tablespoons drippings in pot. Add onion, celery, and garlic to pot and saute for 5 minutes or until tender. Stir in flour and cook for 10 minutes, stirring occasionally. Add clam juice mixture, potato, and all the herbs and spices. Bring to a boil. Cover, reduce heat to simmer for 15 minutes or until potatoes are tender. Mash a few of the potato on side of pan if you like a thicker soup. Stir in clams and whisk in cream. Season with salt and pepper. Cook about 5 minutes, but do not bring to boil so cream does not burn to bottom of pot. Remove from heat and let sit for an hour or make a day early so soup has time for flavors to blend. Remove Bay leaf, thyme and parsley sprigs. Reheat to almost boil temp, ladle into serving dishes and garnish as desired. Serve hot with crusty french bread. In a large heavy pot cook bacon until crisp. Pour off all fat except 4 tablespoons. Add onions, celery, bell pepper and carrots and cook for 10 minutes, until vegetables are softened. Add garlic, bay leaves, oregano, thyme and crushed red pepper and cook an additional 2 minutes. Increase heat to high, add clam juices and potatoes. Bring to a boil, cover and cook for about 20 minutes until potatoes are tender and the broth has thickened a little. Add tomatoes and continue to cook for 10 to 15 minutes. Remove the pot from the heat and add clams and parsley, season with pepper and salt if necessary. 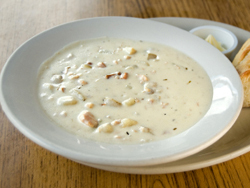 Allow clam chowder to sit for up to 1 hour to allow flavors to blend, then reheat slowly over low fire if necessary. Do not allow to boil.